Sometimes known as the CRONK, Jim Cronk continues to wow audiences as a one man musical extravaganza. Brand new to Jim’s host of over the top services are the Teambuilding with Music program and the official launch of Retreat Studios, Jim’s personal recording studio in beautiful downtown Ramona Ontario. Take the virtual tour by clicking any of the following links. Also please feel free to visit as often as you like and check out the photo gallery. Perhaps your photo made it to the FRIENDS of the Cronk wall of shame! So if you think you are ready to GET YOUR CRONK ON, check out the rest of this site and see how the CRONK can make your next event a huge success. 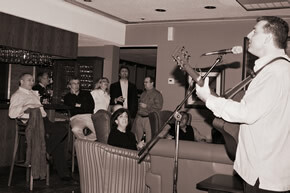 Jim Cronk has been wowing audiences at some of Ontario's finest resort destinations. 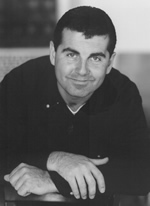 As a solo performer, Jim creates one of a kind entertainment experiences. He sings, he plays, he's funny, he's cute, best of all he's entertaining, and available! This site has been created so you can become more aquainted with Jim and see what services would work at your resort, or next corporate function. Feel free to email Jim, or call him personally with any questions you might have. 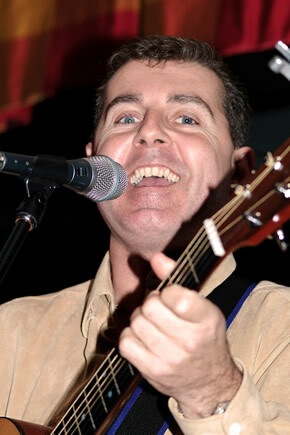 Take a stroll through the site and see why Jims fans call him a one man musical extravaganza. Watch a video on the benefits of team building with Jim Cronk. Take a Virtual Tour of Retreat Studios. What the Cronk can Do For You! An Evening of timeless ballads, acoustic and electric guitar classics, and soft soothing vocal arrangements. For your listening, dining or dancing pleasure. From 1950, thru the year 2000, over five decades of musical memories! Includes full sound, lights and props. From country line dance lessons, to a 50's 60's theme, cozy campfires, and special holiday fun, you name the theme; I provide the musical scheme. Inside, outside, poolside, fireside; it's all good. Optional activities include Karaoke upon request, and a full multimedia experience including DJ, lights, dry ice and props! Wireless and Interactive family Hour! 50 minutes of interactive musical song and dance, fun for the whole family, sing a long and classic dance favorites. High energy delivered tastefully and loaded with laughs. Complete with sound, lights, props, and surprises. A fantastic icebreaker event, anytime, anywhere. Totally wireless, totally awesome, includes full sound and lights. Laugh and smile through 90 minutes of musical memories designed with seniors in mind. Jim strolls through the years in song, skit, and laughter for your mature audience. When seniors are away, "we love Jim" is what they say! Includes full sound, lights and props.